It began as a strike by East Berlin construction workers but quickly escalated into waves of protests throughout the German Democratic Republic. The 1953 uprising in East Germany is not as well remembered today as the Hungarian Revolution of 1956 or the Prague Spring of 1968, but it was no less consequential. On the 16th of June hundreds of thousands of workers took to the streets. A decree to raise production quotas in industry and construction was the initial catalyst, but soon enough the movement was calling for a free country and the resignation of the government. It was violently suppressed a day later by Soviet troops and tanks and East German police. Hundreds of people were reportedly killed. Karl F. Mautner was a Foreign Service Officer assigned to Berlin at the time. He was interviewed by Thomas K. Dunnigan in 1993. Dr. Robert R. Bowie was the Director of the Policy Planning Council at the State Department. He was interviewed by Robert Gerald Livingston, Philipp Gassert, Richard Immerman, Paul Steege, and Charles Stuart Kennedy in front of a public audience at the German Historical Institute in 2008. 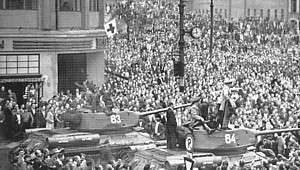 Read about the Prague Spring and the 1956 Hungarian Revolution. Go here for other Moments on the Cold War. MAUTNER: One of the really visible signs of the tension was the flow of refugees from the east to the west. They came through Berlin because access to West Berlin was still free. All they had to do was get on the S-bahn in East Berlin and go into West Berlin. They could come from the eastern zone into East Berlin, get on the S-bahn, and come over. There were occasional attempts to stop them on the part of the east police, but in general there was a fairly free flow into West Berlin. At times there were great masses coming in whenever the pressure increased. With the political pressure, for example to increase the work norms in the factories, and other hardships, collectivization of the farms, more people came out of the east and flowed into the west. West Berlin established refugee camps. People were screened to determine whether they were really refugees and then usually flown out to West Germany, because they couldn’t travel on the autobahn, which was controlled by the east. That thing built up to the very high degree in early 1953, when again the pressure on the part of the eastern communists had increased. They needed higher production. They increased the production norms and didn’t increase the rations, pay, or anything else. That culminated in a big blow-up on June 16 and 17 when the East German workers, especially in the Henni gsdorf steel plant north of Berlin, went on strike. They marched into East Berlin, demonstrated there vigorously. As Russian tanks moved in, they threw rocks at them. It was quite a show. Eventually, of course, it was quashed with brute force. We now know several hundred died. The demonstration extended into various localities in the eastern zone, such as Magdeburg. The 17th of June 1953 is also one of the landmarks of some importance. In fact, in West Germany it became a holiday, although the revolt was put down. Now, we had very interesting allied reactions on that. They were not terribly good, because there were some officials perturbed because the Germans revolted against an allied power. Even though it was the Soviets against whom the workers rebelled. Q: Was this reflected in the attitude of Americans, French, or British in Berlin? MAUTNER: Yes. At the commandants level, where there were relatively new people, it was reflected in reactions like, “Got to be careful that we don’t have a revolt spilling over into our part of the city.” It was not a very nice situation. It was also made more difficult because Mayor Reuter happened to be out of town on that day. He was at an international Social Democratic rally in Austria and it became an urgent matter to get him back to Berlin as quickly as possible, because the acting Mayor was an FDP [Free Democratic Party] man, Dr. Conrad, an inadequate substitute indeed. It was sort of a mixture of old fashioned liberals and right wingers, a funny combination. Dr. Conrad represented the mayor, he was a deputy mayor who was in charge at that time. Dr. Conrad was not a terribly effective or competent man. He was a nice person but that was about it. There wasn’t too much confidence in him on the part of the allies or anybody else. They wanted Reuter back. But it required special permission to fly him home on a military aircraft, to get him on a British military aircraft flying out of Klagenfurt, I believe. But they refused to make that exception, so it took practically two days to get Reuter back and that was quite damaging. There were such problems as West Berlin Social Democrats calling for a protest rally in Kreuzberg [in the American sector], which would have been a big rally…. T he American commandant refused permission, although the police president, Dr. Stumm, a Social Democrat, said it was perfectly safe to have it. There were on the commandants’ level fears that it might spill over into the east sector and cause a lot of trouble. Anyway, the mood was not as good as it should have been, and that was especially noticeable at the memorial ceremony for some West Berliners who had been killed in the revolt in East Berlin. 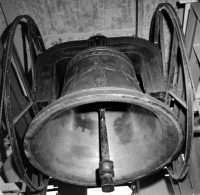 It was at the City Hall; the Freedom Bell rang. The Kommandatura decided not to have the Allied commandants present in uniform because that might give too much weight to the fact that the Allies approved of this whole business. It was a typical reaction. Anyway, Cecil Lyon, our political advisor to our Commandant, permitted my wife and me to take his state limousine with the American flag and we participated in the funeral procession and people thought this was a good show for the Americans. There was also an incident at the funeral commemorative ceremony in the City Assembly hall [the House of Representatives]. There were two conspicuously empty seats where the British and the French liaison officers usually sat. I was there. I think this caused some comment. I assume [they were] under instructions, I don’t know. Anyway, that shows the mood then. 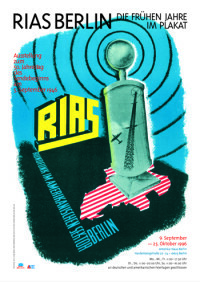 Here I must mention RIAS [Radio in the American Sector], which had great influence in East Germany. The man in charge was Gordon Ewing. He had the responsibility of telling the people in the East what was going on. He could have been incendiary and start a blood bath. He received no guidance from his superiors in Bonn, nor in Berlin. He was able to draw on the wise (and informal) guidance of two FSOs [Foreign Service officers] in our Eastern Section, Charlie Hulick and Jim Ruchti, and with them steered a sound path, avoiding extremist pressures. The three of them deserve much credit. Q: What was the military situation? Did we have many troops there? Were they on alert? MAUTNER: The troops were certainly on the alert. I don’t know how many troops we had there, at least 6,000. Of course, militarily we would have been overwhelmed by the Soviets. At the time, East Germans alone were revolting against Walter Ulbricht. He was the Secretary General of the SED and the actual ruler in East Germany. In theory at least, according to four-power agreements, the Allied forces could have marched into East Berlin and established order. Once the Russians countered, of course, that was no longer legally feasible. But at the time when the Germans were revolting, I think the Western powers had the right to do so. Of course, nobody had intention of doing that. Q: What were the consequences of the June 17 uprising in your view? MAUTNER: That’s a good question. What were the long-range consequences? Well, I think it certainly shook up the East German regime. We mustn’t forget that that was after Stalin had died [in March]. There was great turmoil, presumably, in the ruling forces of the Soviet Communist Party. There were rumors that Wollweber, who was the German Chief of Intelligence and, of course, a KGB instrument, was advocating making concessions. He was removed shortly afterwards. This is all something I don’t know too much about, but it was obviously of considerable importance. One of the consequences was a reinforced split of the city, because for the first time there was really a division. There were entrance/exit checks to control the refugee flow. It was not completely stopped, but it was diminished, and on the part of the West, it became quite evident West Berlin had to be built up further and further. That became one of the really important issues. Reuter at that time made a remark which people didn’t particularly appreciate. He said: “Now look, you’ve got to build up West Berlin. You should really have made it a capital, but you didn’t. West Berlin is the cheapest atom bomb in the heart of the Eastern empire,” meaning that as long as we held on to West Berlin, it’s going to undermine the viability of at least East Germany, or maybe the whole Soviet empire. Reuter unfortunately died very soon thereafter, but I remember those words well. Q: In 1953 the uprising in East Germany and what has come to light since 1989 was that it was not just in East Berlin but across all of East Germany, in hundreds of towns and on a massive scale. Was that something that was known to you and to the Eisenhower administration at the time? Was that a transformative moment in terms of understanding either Germany? BOWIE: Well, this was obviously something which was a very great concern because of two reasons: 1) the Eisenhower campaign had been urging more attention to the liberation of Eastern Europe, and [Secretary of State John Foster] Dulles was particularly eager to do this, to appeal to the votes which would be attracted by the idea of the liberation of Eastern Europe. So, Eisenhower had no question about this. He was not going to have any idea that the United States was going to use force to get freedom for East Europe. 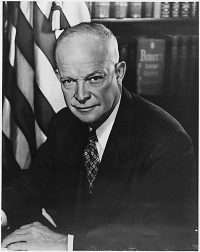 One of the other basic tenets of Eisenhower was that a nuclear war would be an absolute suicidal disaster for both sides and that therefore one of his key purposes was to see to it that our effort to contain the Soviets not lead to the possibility of direct conflict between the forces, because he felt that if you had a real conflict between the two, it would almost surely escalate, and be highly likely to go on until it got up into using nuclear weapons…. He was absolutely convinced that by threatening retaliation he could deter the Soviets from using nuclear weapons and even from a large-scale attack. Earlier, when it was discovered that the Soviets surprisingly had developed nuclear weapons much sooner than expected, [President Harry] Truman had approved NSC 68. This was an analysis of what this implied, and concluded that when they got an adequate inventory of nuclear weapons (by 1954), they would be tempted to use them to annihilate the United States. And Eisenhower rejected this and was convinced that we could deter the Soviet Union if we made them understand the consequences of any such event. 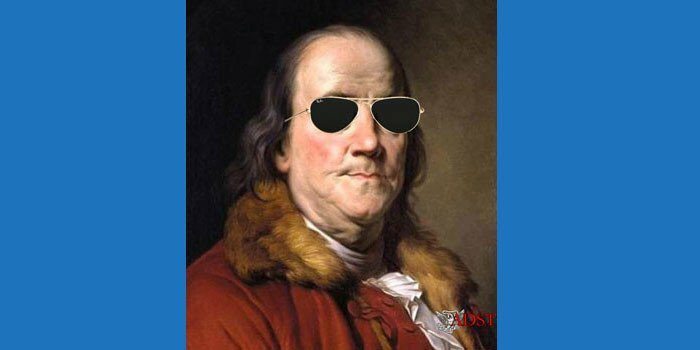 Nevertheless, he was fearful that if their regime or empire was really threatened, then it might very well cause the happening of military conflict. So, coming back now to the uprising in Germany, certain people like C. D. Jackson [General Charles Douglas Jackson, an expert on psychological warfare who served as Special Assistant to the President in the Eisenhower administration] who said, “Oh, this is now a wonderful opportunity; we’ll just exploit this to the fullest.” And some people were urging that we make weapons available to the people who were carrying on the uprising. That was also his attitude even with the Hungarian problem: it was terrible to sit by and not do something, and there were people who said we should at least take some effort to give them weapons and support, but he said, no, he was not going to jeopardize the possibility of peace, of any real conflict, that, agonizing as it was to see the Russians overrunning Hungary, for example, or the putting down of the uprising in Berlin and elsewhere in 1953, that was simply too risky in his opinion for the longer term, for the maintenance of deterrence.